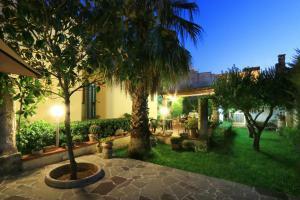 B&B Erminia is located in Presicce, in Salento. It offers air-conditioned accommodation and a garden with sun terrace. Served in the garden in summer, the buffet breakfast includes croissants, cakes, fresh fruit, yoghurt and both cold and hot drinks. With free WiFi, the colourful rooms at the Erminia have a flat-screen TV, small refrigerator and safe. The private bathroom is complete with a hairdryer and toiletries. Most rooms have a furnished patio. Parking near the property is free. The sandy beaches of Lido Marini are 7 km from the property, while Pescoluse is 8 km away. Santa Maria di Leuca is 15 km away, while Gallipoli is 30 km away. When would you like to stay at B&B Erminia ? Offering free Wi-Fi, this air-conditioned room features a flat-screen TV, tiled floors and a private bathroom with free toiletries and hair dryer. Some includes a small veranda. Please inform B&B Erminia in advance of your expected arrival time. You can use the Special Requests box when booking, or contact the property directly with the contact details provided in your confirmation. This property will not accommodate hen, stag or similar parties. Each day we'll check prices and send you an email for your selected dates at B&B Erminia. If you don't have specific dates but would like to check prices for say next weekend or say next month we can check the price too. Click to write a review and share your experience of B&B Erminia with other travellers.